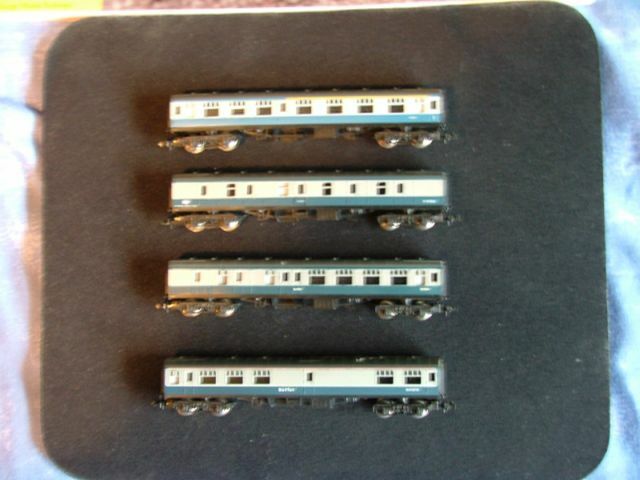 This page is for modellers with excess or unwanted model railway products to sell, trade or swap. Term and Conditions apply (See Below). This site and the webmaster cannot accept responsibility for the sale of items on this page. Items are sold and bought at the sellers/buyers own risk. It is for both parties to negotiate the terms of the sale/purchase and be satisfied that the items description is correct, and that means of exchanging both the item and funds are secure. All in good condition with all buffers and couplings intact. 2nd brake has small dark mark on roof. Will sell individually or as a job lot. Price is £3 plus £1.50 P&P per coach or £10 plus £ 3 P&P for job lot. If interested contact Kevin at "Sold"
I have over 100 Lima Battery Control Units model no 012 which are brand new and boxed which I would like to consider selling for a minimal fee plus postage. If anyone is interested in making me an offer please contact me. Or if anyone can recommend someone I should contact please also let me know. These where purchased as a complete lot when I brought a market stall and various other items from a model railway enthusiast/reseller and I have no use for them. If you have this item for sale contact calladl@ntlworld.com with details.